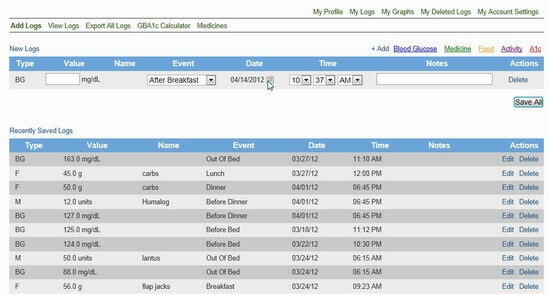 The Glucose Buddy website provides access to your data and a user forum. From the website you can view your log book and export it as a .cvs file for use in a spreadsheet application. While exporting as a .cvs file is convenient, I would like to be able to print the log book from the website, however the website provides no option to do so unless you print the entire web page from your browser. If you have several pages of logs this can quickly consume a lot of paper and ink for color printers. If you wish to print only your log book without the web page content and you are comfortable with very basic use of a spreadsheet program, this is not an issue. Sometimes I find it useful to enter or edit data into the log book from the website. When I tried to enter or edit log data from the website I was unable to select a date. The date picker did not work on IE9, but did work on Fire Fox and Chrome. I don’t consider this an issue with IE9 but an issue with the website developer. I reset all my IE9 security settings to their default levels and the date picker still did not work. Regardless of what you think about the IE browser, you should be able to perform this function. I found the websites graphs less useful than the graphs within the iPhone app. The graphs only provide a single plot line representing the daily average of your glucose levels. At the top of the chart page there is a row of data which provides the overall average and averages of time periods through a day. They also list a single glucose high and low reading for the time period displayed. If you are looking at a 90 day time period, you are only provided the highest and lowest reading over that 90 day period, without any indication of when those readings occurred. Somewhere in that chart are glucose readings of 180 and 77. Unless you go through the log, line by line you cannot learn when those events occured. The graph page also provides a daily carbs consumed in the foods graph and a medicine used graph. The food graph seems useful at first glance, except for one small problem. If you look at the food graph average it displays 16.9 grams. The only way you can get that low of an average with the lowest carb entry at 38 grams, is if you calculate "zeros" for the days with no data. I can only assume that if you skip inputting data for any meal, the average value for those meals are compromised. Averages should be based on actual data provided and not augmented with a zero value for skipped meals. The medicine graph is beneficial, unless you use IE9 for your browser. In IE9 I was unable to select which medicine to display. All medicines were lumped into one value. That is useless. From Fire Fox I was able to select from the various meds I use and the bar graph provided a useful visual indication of my meds. Another useful graph I found was the Glucose by Event. This graph provides the average glucose levels at each event, thus giving you an average of Out of bed, Before Breakfast and so on over the course of the time period displayed. One question I had was, whats the differance between OUT OF BED and AFTER BED? Perhaps the most valuable aspect of any website for diabetes management is the ability to print graphs to take with you to the doctor. The built in ability to print a PDF file of graphs is a nice idea, but the PDF graphs (opens new window) have less information than the website display. There is no high or low glucose levels printed, only the average of all readings and over the time period selected and the average Glucose by Event. It does give you a percentage of the readings that fall within a desired range and the range numbers are provided. That part of the print out should be beneficial for a quick review of how well glucose levels are being controlled. You can print the web page (only from IE) which preserves the graphs as seen on the screen. This ability is lost with Safari, Fire Fox and Chrome. The last problem with the website is the inability to print a specified range of data. You can only select All, Hour by Hour(for one day at a time), last 7 Days, Last 30 Days and Last 90 Days. I wish I had the ability to select a specific date range, but I suspect the pre-defined date ranges may be sufficient for most users.